A cozy blanket, quilted and embellished with applique, can become a favorite thing not only warm, but also decorate both the crib and the bed. A quilted blanket can be a wonderful gift for family and friends. 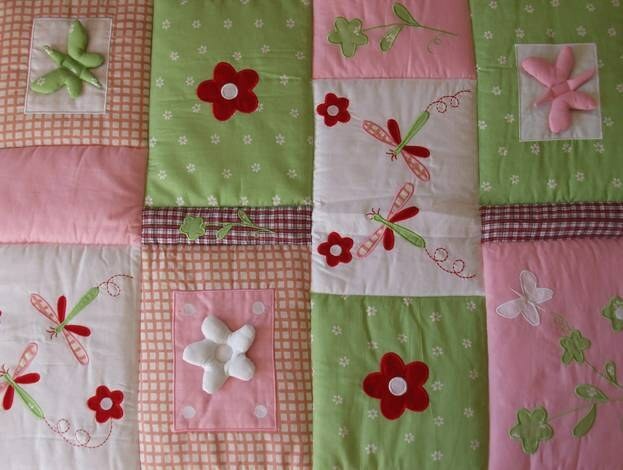 To sew a quilted blanket, consider that it consists of three parts: lower, middle (filler) and the top. Most of the time is given face piece to furnish. It can be made as one solid piece of material, and individual patches, which usually have seamstresses accumulated quite a lot. Some fans patchwork specifically acquire a small pieces of various fabrics (cotton, linen) with a suitable figure which can then be used to create interesting compositions. Before you start to design the top of the quilt, it is necessary to conduct preparatory work. For this alleged piece of cloth be sure to wash it, thus checking their ability to molt. Prefer the fabric that does not have this drawback, or later in the process of washing for a few fragments (even very beautiful) will deteriorate the whole product. After washing each, still unformed, the flap is carefully athlete. Now move on to cutting out and creating the General pattern of the top of the blanket. If you have not worked with enough scraps, you can make the top only of squares, alternating with long strips of fabric (even a different texture). When working with scraps on hand constantly needs to be iron, as each fragment as sewing, it is desirable to make amends for that will lend a neat look. Sew along the length of the 5 squares, smoothing down the seams in one direction. Get band size 22х102 see just these 4 blanks. Sew one of them on the whole length stripe satin fabric and smoothen the seams. Alternate strips with squares with Atlas, which will be located at the edges of the blanket. After connecting all parts again iron obtained, still unfinished, top. Now sew the remaining 2 strips of satin (142 cm) with two other parties, smoothen the seams. The result is the top part where the squares are interspersed with satin stripes fabric. For the bottom of the blanket take a solid piece of material (cotton or linen) size 145х145 cm (seam, 5 cm each side). The middle part is made of filler, which is well suited batting or a synthetic winterizer. Vykroyte the inner part is the same size as the bottom, that is 145х145 see Consistently put all three pieces of the quilt, baste them together, starting from the middle to the edges. Apply with a chalk (or a piece of light remnant) markup for stitches (it can be done right at the seams of the squares). Quilted blanket on the markup, gently stretching while stitching. The edge of the blanket, first align the scissors, and then process piping, which adjust the tone to the product. Each seam is sewn the patch of sure sagleipie iron.